Moto E4 will feature a 5-inch (1280 x 720 pixels) HD IPS display Powered by 1.3GHz Quad-core MediaTek MT6737M 64-bit Processor with Mali T720 MP1 GPU. It has a 2GB of RAM and 16GB of internal storage. On Camera, it has an 8MP rear camera with LED Flash and 5MP front-facing camera Packed with a 2800mAh Battery. Motorola Moto E4 Plus will feature a 5.5-inch (1280 x 720 pixels) HD IPS display Powered by 1.3GHz Quad-core MediaTek MT6737M 64-bit Processor with Mali T720 MP1 GPU. It has a 2/3GB of RAM and 16GB of internal storage. On Camera, it has a 13MP rear camera with LED Flash and 5MP front-facing camera Packed with a 5000mAh Battery. 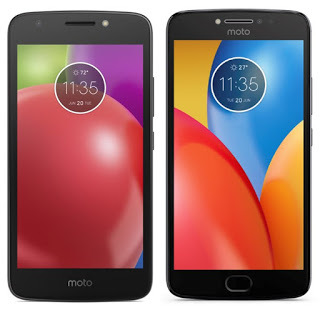 Moto E4 will come in gray, gold and blue color priced at around 150 euros, while the Moto E4 Plus is expected to be around 190 euros will probably have only in gray and gold. Both Phones expected to launch later this year along with Moto C, C Plus, Moto Z2 series.